These attributes help Mega Man progress through the game on his mission to defeat the final boss, Sigma. What would happen if you took Mega Man out from his video game and dropped him into the world of Super Mario 64 (like a crazy spin off of the movie Wreck it Ralph)? Try as Mega Man might, he wouldn’t be able to beat the game of Super Mario 64 because he doesn’t have the necessary Attributes such as long jumping, triple jumping, swimming, and flight (with a magical winged cap). Your Attributes include physical attributes, personality traits, IQ, EQ, etc. For example, some people are incredible athletes, while other people have a silver tongue, and others have a natural ability with numbers or music. Your Attributes do not include learned skills such as an expertise in SEO, software engineering, law, medicine, or Gamification. Your Attributes are part of who you are — your DNA, upbringing, and life experiences all make a difference in you Attributes. It’s important to understand that your Attributes do NOT make you a better or worse person than anyone else. Please do not judge yourself or other people based on Attributes. In addition, it’s important to understand that Attributes alone are NOT enough to beat a Game. We can all play Mega Man X, but very few of us have the patience, persistence, and dexterity to beat the game (seriously, Sigma is an incredibly difficult boss). Similarly, many people have musical talent, but it takes hard work and perseverance to play for the San Francisco Symphony. It’s important to know and be honest about your Attributes because you don’t want to be Mega Man playing in Super Mario 64. But don’t get discouraged if you weren’t born with the Attributes of a Lebron James or Beyoncé. With your unique Attributes, you are able to do things that Lebron James and Beyoncé cannot do, and you should be proud of that. In video games, there are character sheets that detail the special powers of characters. In contrast in real life, we are unfortunately not born with a character sheet that explains what are our Attributes. Therefore, it is a quest to discover your Attributes and help others to do so too. Some natural Attributes are easier to identify, as the activities are not only part of most school curriculums, but are also easy to compare with other students. For example, many physical or musical Attributes become obvious because they manifest themselves in a public setting: you run or swim faster than everyone else; you learn to play the guitar incredibly easily, and alongside your unique charisma you start to entertain your followers on Instagram with music. At times, natural Attributes with numbers, writing, memorization, or speech can manifest themselves in school as well: you get A’s in classes without needing to work as hard as your classmates; you become a champion in your school speech or debate team. Some people get lucky because they get exposed to their natural Attributes early in life, often because of where they grew up or the investment of parents in various activities. But for most of us, our Attributes aren’t so glaringly obvious. I’m one of them, and it’s taken me years (more than a decade) to truly feel comfortable and accept my Attributes. Carve out an hour or two in your busy schedule to sit down alone with a pen and paper to reflect and analyze your experiences. Why it’s important: Bruin Consulting was my first entrepreneurial project. I realized that it was extremely difficult for Bruins to get a career in consulting because I failed to get a consulting job during Fall recruitment. I thus started the first undergraduate consulting organization at UCLA with a group of three other founders and successfully launched the first undergraduate case competition. Identify Attributes: I’m able to quickly turn ideas into action; I’m able to build a team of motivated individuals and harness their skills towards a common goal; I’m able to win over people easily. Why it’s important: RewardMe was a loyalty platform for restaurants and retailers and was Yu-kai and my first funded startup. We ran it for over two years and managed to build a product, sell it to customers, get it in stores, collect revenue, and reach major user engagement goals well before our competitors at the time. For many reasons, we ultimately failed to make RewardMe a big success. Identify Attributes: I feel comfortable taking risks; I’m able to sell products through sheer hustle; I prefer to learn through action as opposed to learn through reading or mentorship; I’m impatient and want success now. It may seem counterintuitive, but your friends, family, and co-workers can offer great insights into your Attributes. You are the CEO of a company. What would you hire me to do at your company? I’m giving a TED talk next month. What do you think would be the title of my TED presentation? Your friend has an open position at his company. You refer me and I get the job. One year later, you meet up with your friend and he tells you how I’m doing at his company. What does your friend tell you about me? I was just fired from a company. What do you think was the reason for me getting fired? Although these questions won’t give you an exact answer, the answers will help guide you to identify your Attributes (yes, even question #4, which reveals your weaknesses, helps in identifying your Attributes). Be aware that many people are not accustomed to requesting and getting feedback from their peers. It can often be jarring to know how others view you. When you do get back some answers, don’t worry if they are the “right” answers — simply jot them down. Understanding and utilizing our Attributes can be a lifelong exploration process, starting with small steps. Also, start examining if you can break these Attributes down into more detailed ones. … then you can explore what makes you good at math. Is it doing arithmetic calculations in your head, because of the tenacity at which you practice it, or perhaps concentration during stressful moments that require patience. Perhaps it’s all three? By breaking down your strengths you can more accurately understand your innate Attributes and understand where else these talents can be applied to. … then you can explore what makes you have an outstanding memory. Are you good at remembering events, people, numbers, images, or all of them? Exploring the specifics about your memory will help you identify your unique strengths. … then you can explore what characteristics enable you to be likeable. Are a lot of fun to be with because of your humor, positivity, or charisma? Or are you likeable because you can quickly convey that you are a sincere empathetic person and can earn the trust of others? There are a myriad of self assessment tests on the market. I’ve taken many of them, but the only one that I’ve found truly useful is the Strengths Finder test by Gallup and Tom Rath. Significance: People who are especially talented in the Significance theme want to be very important in the eyes of others. They are independent and want to be recognized. Activator: People who are especially talented in the Activator theme can make things happen by turning thoughts into action. They are often impatient. Although the Strengths Finder test won’t reveal specific Attributes (for example, that you have a natural talent in music or math), it will give you clues and guide you on the path to discover your Attributes. I have the ability to get a project started incredibly fast. If an idea fascinates me, then I’ll take action and get the idea started faster than anyone else I’ve ever met. I have the ability to recruit and inspire others to join my team. Whether it be at RewardMe, Chou Force, or Humble Bee, I’ve continually showed the ability to build a strong team. I have the ability to make a strong and positive first impression. This strength has proven incredibly valuable in interview and sales settings when time is scarce and a deal needs to be closed. If the pressure is on or I’m in the spotlight, then I have the ability to take ownership, work even harder, and do what it takes to succeed. While I’m quick to start a project, it’s too easy for me to get bored, drop my current project, and move on the next one. For this reason, I’ve made a decision to say “no” to any new opportunities and focus solely on my current, ongoing projects. Although I make a strong first impression, I am terrible at keeping up strong friendships with many people. I have many acquaintances, but very few close friends. If I’m not getting recognized for the work that I’m doing, then I usually ignore the work and move on to something else that will bring me greater recognition. Yu-kai initially thought that one of his strengths was creativity. But later on he realized that it was because his brain was good at automatically making connections between things that are seemingly unrelated to most people. He then decided that his Attribute was “Associative Thinking”, which also makes him fairly talented at creating analogies to explains things as well as coming up with fun interesting names. As you can see from Yu-kai’s example, by digging deeper into each of your strengths, you can begin to derive your true Attributes. Yu-kai Chou developed the OP Talent Triangle to understand and identify Attributes. Because he created it, I’ll let him explain it in his own words. The following section is written by Yu-kai. Each individual has one unique strength that is better than the majority of the world — the “Edge”. Then there are two to five other skills that may not be as strong as the Edge, but that are stronger when compared to most of your peers — the “Ring”. Then there is a whole batch of other Attributes (often 5–15) where an individual is generally more talented than the average person, but that can’t be considered as a competitive advantage on their own — the “Base”. As individuals begin to understand their strengths, they can start to chart this onto a triangle shape, which I call the OP Talent Triangle. As mentioned above, deriving a proper Talent Triangle is not easy and requires years of self-discovery. However, we can begin by taking simple steps. The way that I did my own Talent Triangle was to first randomly jot down all of my strengths. These are just Attributes thrown around in no particular order besides what comes top of mind. The next step I did was to start to move the ones that seem stronger to the top, while moving moderate ones to the middle or bottom. I decided that Associative Thinking is my Edge, while Empathy, Learn-Use Conversion (the ability to immediately apply something newly learned), Optimism, and Visual Models Creation (turning something abstract into a visual chart) together form the Ring. If I could spend more of my time and energy doing activities (or Quests) that harness the strengths above, I could potentially become best-in-the-world in those activities. After doing much of the activities above, I became an Author, Speaker, Entrepreneur, and Consultant in Behavioral Design and Gamification. I also started Octalysis Prime in order to inspire others and guide people towards their own 10,000 Hours of Play. Once the vague order of the Attributes are determined, then I put together the actual Talent Triangle. Even though the Base talents are not as strong as the Ring talents, the more you find yourself in environments that can harness a combination of those talents the better. For instance, while working on this, my “Pattern Recognition” talent noticed that there were actually four “themes” in these skills. Human/Emotions Theme: Empathy skills connect with emotional persuasion and Trustful Sincerity where people quickly start to trust an individual. Attitude Theme: Optimism leads to more Tenacity, Adaptability of the environment, and even the quirky personality that some people like. Associate Thinking Theme: As my mind connects seemingly unrelated things together, I can always find ways to connect things I have learned to new scenarios, as well as create a visual model that connects all the dots. Pattern/Logic Theme: Pattern Recognition allows me to think critically with strategy and long-term vision, and it helps me realize which creative ideas are too crazy and illogical. Now, what I can do with these four themes is still unclear. But by identifying them (just like Identifying the 8 Core Drives of the Octalysis Framework connect to themes such as White/Black Hat and Left/Right Brain), this understanding could become something valuable to OP Members in the future. Now that I have a better understanding of my strengths, let’s move on and use the same process to determine my weaknesses. I then created my Weakness Triangle. This list is smaller not because I have less weaknesses, but because I didn’t spend as much time on it compared to determining my strengths, and that it is not as useful as the actual Talent Triangle. Still helpful nevertheless. And took a weak stab at Jun’s Weakness Triangle too. As you can see, Jun’s Triangles are not as well-defined as mine because identifying your Attributes isn’t a one day or even one week endeavor. It could take months or years to have a refined Talent Triangle that will guide every activity of life. Use the above methods to identify your Attributes and develop your Talent Triangle. Take your time: getting meaningful answers from your friends and co-workers takes time, but it’s worth it to get to the truth of your Attributes. Take your time with the Strengths Finder 2.0 test as well. Although you’ll get your answers immediately, read through all of the materials they give you because it’ll provide you with great insights. We do not have a business partnership with Strength Finder. Please be aware that it costs money to take the test. 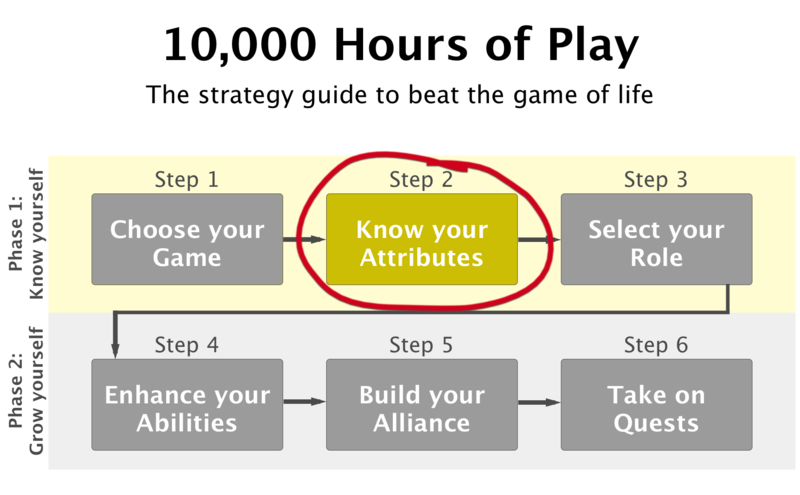 This is the third post in a series that will dive deep into the 6-steps of the 10K HP strategy guide. We will publish a post once per week and will email our subscribers to notify them about the published post.